NorthClicks Review – Is it a Scam or Legit? NorthClicks was launched by David Macdonald in March 2013. It has over 45,000 members and has paid over $22,000 to its members. Admin of this site also own another site Globalactioncash that is also paying to its members. Still this site is new and it need to do a lot in order to be called a well-established site. NorthClicks is a pay to click (PTC) site where you can money by clicking ads, watching videos, playing games, competing offers and surveys. Other than this you can also earn referral commission from people you personally refer. How to Earn Money from NorthClicks? 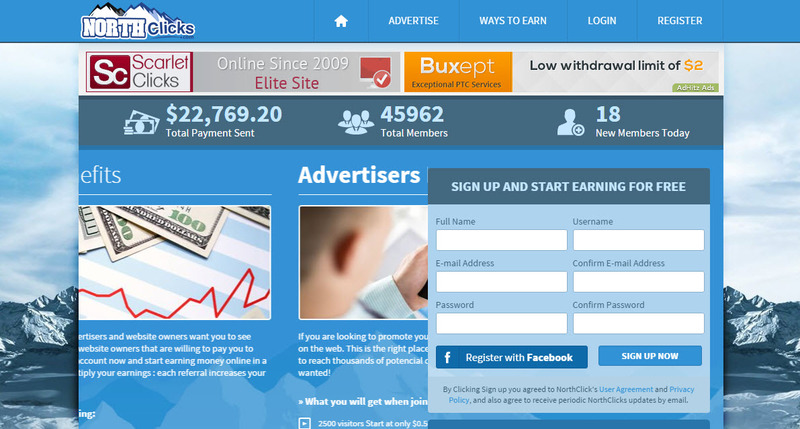 Pay to Click Ads – Click on PTC ads and view for few seconds. NorthClicks offers very low rate of $0.0001 to $0.0025. 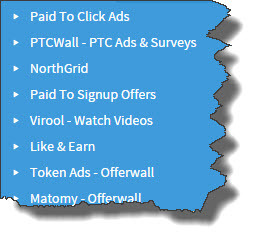 PTC Walls – You can find PTC ads, Quick tasks and Network Offers. PTC ads are similar to above. Quick task includes different signup offers that can pay you $0.75 to $0.01. Network offers includes different offers and surveys that can pay you $0.05 to $5. NorthGrid – You have daily 5 chances that can win up to $0.10. All you need is to click on any grid box and view ad for few seconds. If you are lucky then you can earn $0.10. 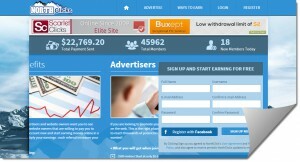 PTSUO – PTSUO stands for paid to signup offers. In paid to signup offers you are paid for registration in different companies. Virool – Watch Videos – Watch videos for few minute and earn money. You can earn more money from videos by upgrading your membership. Token ads Offerwall – Complete offers that are powered by token ads and earn virtual cents. Each virtual cent is equal to $0.0012. Matomy Offerwalls – Complete offers that are powered by Matomy and earn virtual cents. NorthClicks is free to join for every member and available to worldwide members. It has a minimum withdrawal limits of $1 for first time and $2 for all subsequent withdrawals. NorthClicks offers unlimited direct referrals system to its members and good for those who can make large team. NorthClicks is a buxenger supported site and also has a forum for its members in order to interact and share their info and ask queries. This site also has a marketplace where you can buy and sell direct referrals and good point is that it require minimum requirements for direct referrals to buy or sell. NorthClicks offers least rates in the industry and this is the reason this site has very few members. You can find even $0.0001 value ads and you can work on your own then it can take you months to reach first withdrawal limits. You are most largely dependent of direct referrals which is not easy to make. This site has very strict terms and conditions and you should follow these terms otherwise your account get banned. Especially they are very strict on using proxy for viewing ads because most of the ads are geo targeted. If you are form USA the NorthClicks provides you daily large number of ads and other earning opportunities but very low of you are from other places. This is good for people who are purchasing because if the above three conditions can find in referrals then it is most likely that he/she will click in future. Older the referral with high click rates, then higher the cost will be. By performing different activities on site you can earn points which you can convert into cash and conversion rate is $1 = 100 points. Points can be earned from referrals signups, PTC clicks, PTSU and dollars deposited into your account. Heads or Tails – Here you can earn up to 200% of the amount spend. Crack the Vault – Here you need to guess the number and if you are right then you can win the prize. Northclicks is paying over two years to its members and in this site you can earn extra money online by doing simple tasks such as viewing ads, completing surveys/offers and making referrals. This site will not make you rich as it offers very low click rates but at least the site is stable and sustainable. There are multiple earning opportunities available and you can use all these in order to boost your earnings. Apart from this you can buy advertising packages at a very affordable prices at Northclicks. I only recommend NorthClicks if you can make large active referrals otherwise it is waste of time. Still if you make large referrals then it is very difficult to earn full time income and in order to earn full time please see my #1 recommended program. If you have any queries about NorthClicks then please ask in comment section below and i am very happy to help you out. Please also share your experience with NortClicks if you are already it member. Zukul Ad Network Review – Is ZAN a Scam or Legit? Zukul Review – Is it a Scam or Legit? How to Get Direct Referrals for PTC Sites?